This fine antique Victorian sterling silver tea service consists of a teapot, cream jug and sugar bowl. Each piece of this service has a plain circular rounded form onto three ball feet. The surface of each component is plain and unembellished. The teapot is fitted with a flush hinged hallmarked cover which retains the original ivory and silver ball finial; the flush hinge indicates the fine quality of this service. The impressive antique teapot has a plain straight tapering spout. The teapot and cream jug are fitted with plain rounded C shaped handles. The cream jug and sugar bowl have gilded interiors. This tea set is accompanied by the original hallmarked teaspoons and sugar tongs, crafted in the Hanoverian pattern. 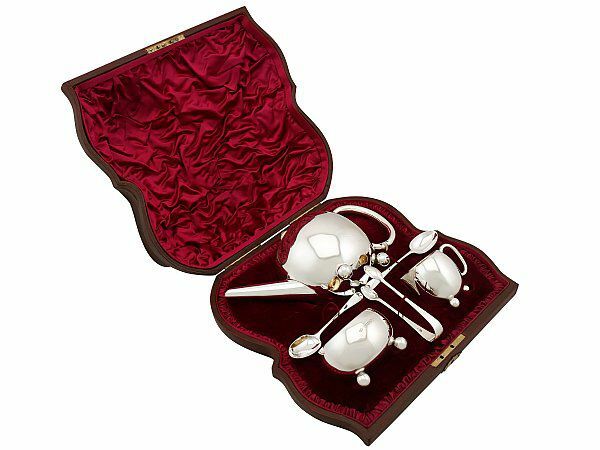 This Victorian bachelor tea set retains the original fine and impressive hinged leatherette box with a satin and velvet lined interior and a push fit catch. The anterior surface of the presentation box features the original hallmarked sterling silver shield shaped cartouche bearing the contemporary engraved inscription 'Presented to Colonel R. V. Malden, 1st Sind Horse, by some of the officers who have served under him, Nov 29th 1885'. This antique tea service is a very good gauge of silver, fine quality and in excellent presentation condition. The cover to the box has subtly contorted and no longer sits flush when closed; this impressive box can be considered in excellent presentation condition, in keeping with age. Full hallmarks struck to the surface of each piece, the cartouche to the presentation box, the reverse of the spoons and interior of the tongs are all very clear. The part hallmarks to the interior of the teapot cover are also very clear. Length from back of handle to tip of spout 20.3cm/8"
Height to top of finial 12.4cm/4.9"
Length from back of handle to tip of lip 7.7cm/3"